.090 ID x 1/4 OD x 0.32 Thk. Pack of 6. Non specific photo to show type of part. .115 ID x 1/4 OD x 0.32 Thk. Pack of 6. .14 ID x 5/16 OD x 0.32 Thk. Pack of 6. .171 ID x 3/8 OD x 0.32 Thk. Pack of 6. .194 ID x 1/4 OD x 0.32 Thk. Pack of 6. 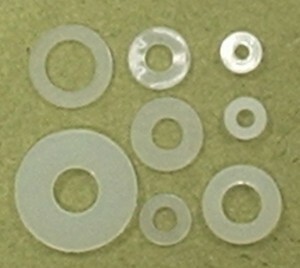 Flat Nylon Washer 1/4 ID x 3/4 OD x .06Thk. Pack of 6. Flat Nylon Washer 1/4 ID x 7/8 OD x .06 Thk. Pack of 6. .250 ID x 1/2 OD x 0.03 thick. Pack of 6.